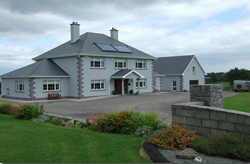 The Maharees is located in the South-West of Ireland in County Kerry. Situated off the Dingle Peninsula. It is mostly a sandy spit jutting into the Atlantic Ocean. Off the peninsula lie the Maharee Islands or the Seven Hogs. The largest island contains remnants of an early Christian monastic settlement. The Maharees is known world wide among surfers, with the Atlantic swells and the wonderful sandy beaches. World Championships have been held here. Aeroplane: Kerry Airport is the closest airport to Maharees - 50km. Click here for details on Irish Airports. Sorry there is currently no listings for Maharees.